I've never considered myself a writer. I'm actually not great at expressing myself with my words, and it's something I've always had to work extra hard at doing. It's kind of ironic that I have a blog... However, one of my favorite ways to express myself has always been in photos. I've always appreciated the art of photography and been interested in the story that is being told in a photograph or a series of photographs. I remember growing up and being so intrigued by the last few pages in my Teen Vogue Magazine... Who else read Teen Vogue like it was your job? Haha! The last major spread would always feature several different looks on a model or even a couple models with a common theme. I would stare at those pictures for so long and just imagine what it would be like to be a part of an editorial shoot that told such an interesting and dramatic story. Zach and I just returned from a trip out west. We started out near the coast in Los Angeles where I was showroom modeling for a few days during market week, then we made our way to San Diego for a bit, and finished the trip by road tripping out to Phoenix, Arizona to stay a night with Zach's grandparents! We knew we wanted to stop and shoot in a couple national parks along our way from Cali to AZ, and decided that one of our stops would include the Imperial Sand Dunes. Who knew sand dunes like these even existed in the US?! 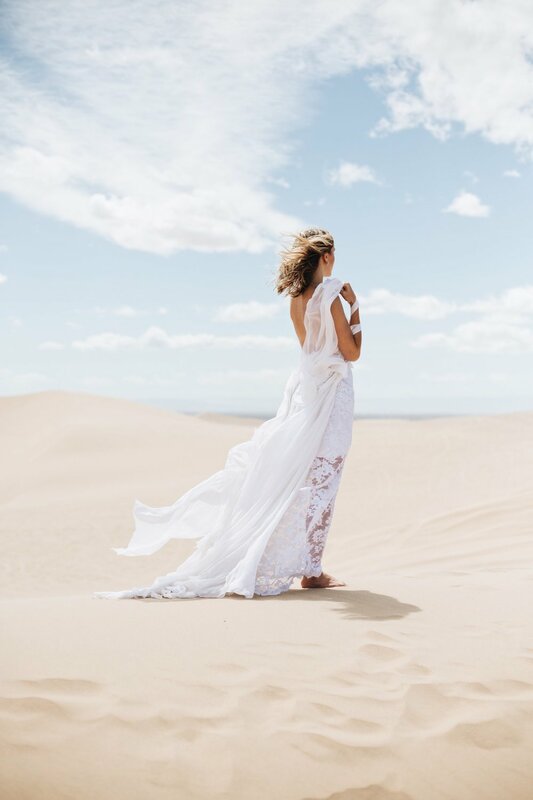 As we were planning our trip and deciding on what looks to shoot, I knew that I wanted to shoot a gorgeous + flowy dress in the dunes. Zach had the brilliant idea of shooting my wedding dress. At first I kind of laughed, but then thought... why not?! What girl doesn't want to find literally *any* excuse to put back on her wedding dress years after her 'big day?!' So sure enough, after a long process of getting my dress dry cleaned and flown in from my parent's house in South Carolina ((thanks Mom + Dad! )), we actually did shoot my wedding dress at the beautiful Imperial Sand Dunes! As glamorous as it may sound, it was kind of a hilarious process. When we finally parked the car at the dunes and I opened the door, it flung wide open super aggressively because it was SOO windy outside!!! And not just the Beyonce-fan kind of wind blowing nicely in your hair, but the crazy + powerful kind of wind and sand blowing nonstop! Not to mention, we were not alone at this park... there were a bunch of people in lounge chairs drinking beers and having a good time in the parking lot watching their friends who were racing out on the dunes in ATV's- ha! I was kind of embarrassed to go put on my dress and shoot because I knew we would have an audience, but I thought it's either now or never, lol! So I grabbed my dress and fought the wind all the way to the disgusting bathroom. From the looks of the "bathroom" floor, it might as well have been the beach because all you could see was sand from the wind that was blowing it in! ((PS-- the toilet wasn't even an actual toilet... it was like a camper/porter-potty toilet, haha! So gross!)) I couldn't believe I was changing into my expensive wedding dress in a place like this, but I felt like/really hoped it would be worth it in the end. And if not, I'd at least have a funny story to tell!! :) After I got dressed and put on loads of sunscreen, I walked out of the bathroom laughing because I could only imagine what all of the people around us were thinking..."Um what the heck is that chick doing in a wedding dress?!" LOL! Anyways, we finally found a good spot on the dunes semi-away from the racing ATV's and started shooting. The whole time, the wind was causing the skirt of my dress to blow around like crazy!! It kept getting twisted and knotted, so we would stop every few minutes to try and untangle it as best we could. I wasn't sure how the photos were going to turn out, but in the end I could not have been happier with them! As I mentioned before, I've always wanted to be a part of an editorial shoot that tells a specific story. As I was going through these images, I realized that I finally got my wish! Of course I've had many shoots over the years that told a story, but nothing quite like this one. And most importantly, I couldn't help but see an unexpected parallel between the photos and what this weekend represents. Today is Easter Sunday, and to some people that might just be like any other Sunday... but to me, this day means everything. As a Christian, Easter represents the very foundation of my faith. It is the day when Jesus, the Son of God, was raised from the dead after dying on the cross to redeem all humanity. A brutal + sacrificial death that in turn created a clean slate for everyone to be able to embrace. These photos remind me of this 'clean slate' that I am so undeserving of, but nonetheless greeted with day after day. Amongst all the chaos that was going on during our shoot, these photos are peaceful yet bold; graceful yet daring. A powerful + continuous wind of love bombarding me no matter what I do, as well as a light that will never escape me. Happy Easter everyone!! I hope you guys enjoy these photos!